Alcachofas con jamón is very easy to cook, especially if you use canned artichoke hearts. 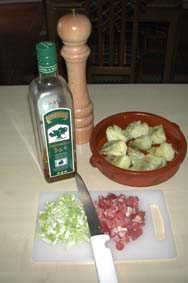 May be served as a tapa or as a starter. Photo: The artichokes are ready to be gratinated in the oven. Pour some olive oil in a gratin-dish. Add the artichoke hearts. Cut them in half if they are big. 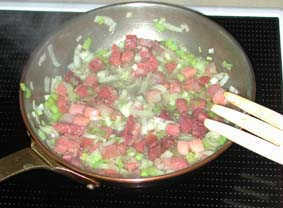 Fry the ham and leek in olive oil (0.2 cup) in a pan until the leek is soft, for about 5 minutes. If you use garlic, add it at the same time. 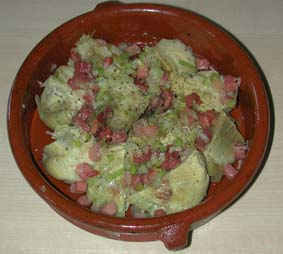 Pour the ham- and leek mix on top of the artichokes. Include the olive oil in the pan as well. Gratinera i varm ugn tills rätten får fin färg och kockorna är genomvarma. Bake in a hot oven until it has taken a nice color and the artichokes are thoroughly hot. the leek is soft, for about 5 minutes. If you use garlic, add it at the same time.